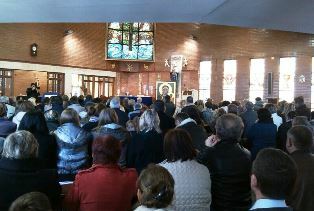 On Sudany evening of the 24th of February the Mother of God came to the church of St. James in Villaviciosa de Odón. The pastor, father Alvaro Ojeda welcomed the Mother of God very solemnly. As the pastor of families in the Diocese of Getafe he had been much involved in preparing the peregrination. Now he was welcoming the Icon in his own parish with joy. The homily was said by bishop Joaquín María de Andújar. After prayers a solemn procession went into the central streets of Villaviciosa de Odór to the retreat house of “Los rosales”, where the Icon of Our Lady spent the night. On the next day in the morning she went to visit Griñón.